Reputable GSD breeders do not sell their puppies to the first interested buyer. Any reputable GSD breeders will not sell their German Shepherd puppies to the first interested buyer or person that they come in contact with! German Shepherd breeders who are truly interested in their puppies well-being will always require the potential buyer to answer many specific questions before selling any of their German Shepherd puppies to that person. about why you want a German Shepherd puppy in the first place, what kind of home you can provide their GSD puppy, etc. This is normal and to be expected. • Explain why you want a German Shepherd in the first place. • Tell the GSD breeder who will be responsible for the puppies daily care, where the puppy will spend most of its time, will the GSD puppy attend training classes and what "rules" have been decided upon for the puppy - for example, will the dog be allowed on furniture? • Sign a contract that you will spay or neuter the dog unless you will be actively involved in showing him / her (which applies to show-quality dogs only). • Sign a contract stating that you will return the German Shepherd to the breeder should you be unable to keep the dog at any point in the future. • Provide a veterinary reference. • Provide written proof from your landlord or condominium board (if you rent or live in a condominium complex) that you are allowed to have large dog breeds. 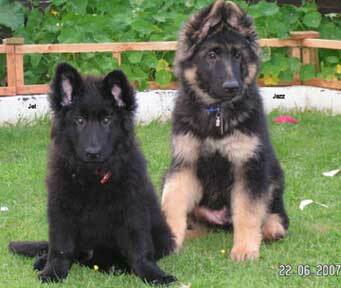 • Provides references of other families who have purchased German Shepherd puppies from her. • Encourages multiple visits to their kennel and wants your entire family to meet the puppy before you take your new GSD puppy home. • Gives you detailed guidance on caring and training for your new German Shepherd puppy and is available to you after you take your puppy home with any questions that you may have. • Provides you with a written contract and health guarantee and allows plenty of time for you to read it thoroughly before signing it, and completing the purchase. 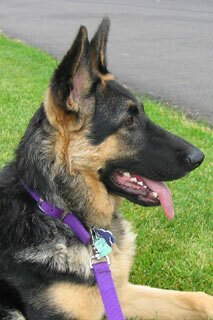 • Actively competes with her GSD's in conformation, obedience or agility trials. Reputable GSD breeders will also work with local, state, and national clubs that specialize in their specific breeds. • Does not have German Shepherd puppies available all the time but keeps a list of interested people for the next available litter. • Feeds their GSD puppies high quality "premium" brand puppy food . • Is well versed in all potential genetic problems inherent in the German Shepherd breed and who can explain to you what those concerns are and the outcomes may be concerning these. • Will provide you the records of all veterinary visits for the puppies, shot and worming schedules. The GSD breeders will also explain the puppies medical history and what vaccinations, etc. your new puppy will need in the future. • Encourages you to spend time with the both of the German Shepherd puppies parents and litter mates when you visit. • Is highly knowledgeable about the German Shepherd Dog breed standards (the desired characteristics of the breed in areas such as size, proportion, coat, color and temperament) and breeds accordingly to promote this in the breed. • Possesses German Shepherd Dogs and puppies who appear happy and healthy, are excited to meet new people, and don't shy away from visitors. • Allows you to visit where the GSD's spend most of their time and maintains an area that is clean and well cared for.